A few weeks ago we lost the great British songwriter Rod Temperton. He was a member of the disco band Heatwave and was poached by Quincy Jones to write songs for George Benson, Donna Summer and Michael Jackson among others. He was known as the invisible man because he shied away from the spotlight and if you passed him in the street you wouldn’t really know who he was, but his songs were known worldwide, much the same can be said of the man who co-wrote this week’s song, One, Two, Three O’Leary as recorded by Des O’Connor and co-written by the legendary songwriter Barry Mason. I had the privilege of interviewing Barry last month and what a joy he was. We met at his home in west London where we sat and chatted about music, his favourite songs and his one-man show. I’d read on his website that he stumbled into songwriting, so I asked how one stumbles into such a profession. “I’d done a very short spell in pop management and in 1959 I’d met this guy in the pub and he said he was a singer, his name was Tommy Bruce. The Big Bopper had not long had a hit with Chantilly Lace and I suggested he record a cover of Fats Waller’s Ain’t Misbehaving in the style of the Big Bopper.” He did and Barry produced it and went to number three in 1960. Barry got the songwriting bug, “I found it easy to do in my own leisure,” he said, “but when the pressure is on to get a song done, it’s much more difficult. Barry co-wrote many songs with Les Reed, his writing partner whom he was very complimentary about, “Les would sit down at this grand piano and play the most wonderful chords and then I would add my lyrics.” Together they wrote Here It Comes Again (The Fortunes), The Last Waltz and Les Bicyclette De Belsize (Engelbert Humperdinck), Everybody Knows (Dave Clark Five), I’m Coming Home and Delilah (Tom Jones), It’s your Day today (P.J. Proby) and Des O’Connor’s massive 1968 number one, I Pretend. Over the years Barry has also written with other well established tunesmiths including Tony Macauley on the massive 1970 chart-topper Love Grows (Where My Rosemary Goes), with Peter Shelley on the Alvin Stardust hit Good Love Can Never Die and with Roger Greenaway on the Drifters’ hits There Goes My First Love and Can I Take You Home Little Girl and Our Kid’s number two hit You Just Might See Me Cry. 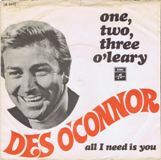 One name that has appeared as the co-writer on One, Two, Three O’Leary next to Barry’s was Michael Carr, a name that I wasn’t too familiar with, but whilst researching I found that he was a songwriter from a different era. Michael was born in 1905 with the real name Maurice Alfred Cohen. “Michael has written South of the Border (Down Mexico Way) with the great Jimmy Kennedy,” Barry told me. They also wrote We’re Going to Hang out the Washing on the Siegfried Line in 1939. In the 1950s, Michael wasn’t keen on the music of the day and was quoted in Billboard as saying, “Music has degenerated into rubbish” but it didn’t stop his co-penning Lonely Ballerina for Mantovani and Man of Mystery a tune which became the theme to the feature film series the Edgar Wallace Mysteries and recorded by the Shadows. He also wrote their 1961 number one Kon-Tiki. Anyway, “I was in a pub one day,” Barry revealed, “and Michael came over to talk to me, he was quite drunk and my publisher said to me, ‘ignore him, he’ll drive you mad’, but I felt a bit sorry for him and after a while we talked about writing his song based on the children’s nursery rhyme.” The rhyme goes one, two, three O’Leary, four, five, six O’Leary, seven, eight, nine O’Leary, ten O’Leary caught it. It’s played a bit like hopscotch but with a ball. It was the follow-up to I Pretend and made number four on the UK chart. Sadly Michael did not live to enjoy its success, he died in London two months before it charted, he was 63. Seven months earlier however, he did write the words to Ben Nesbit’s theme tune to the television show White Horses which was a top 10 hit for Jacky. I asked Barry what his favourite song of his was, “The Last Waltz,” he replies, “I’m still very proud of that one.